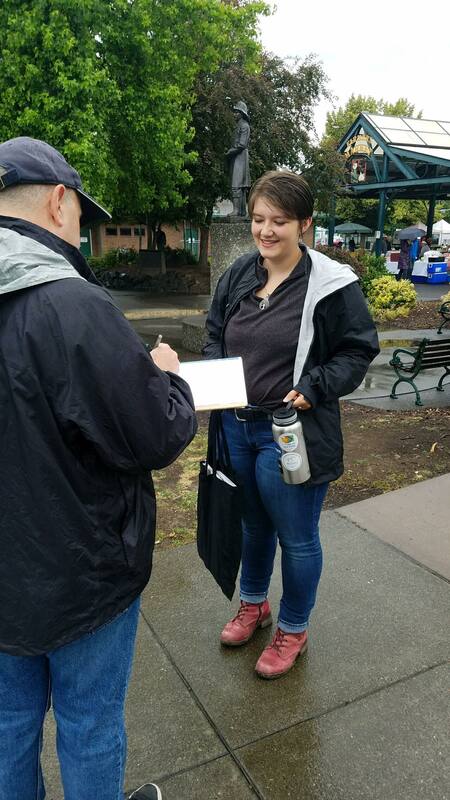 “Would you like to sign here for clean air and clean energy?” I ask a group of men walking towards the Walla Walla Farmers Market. “No, I want dirty air and dirty energy,” one man replies, completely serious. I smile and say, “have a good day!” before greeting the next group of strangers. Gathering signatures for a campaign isn’t always easy. 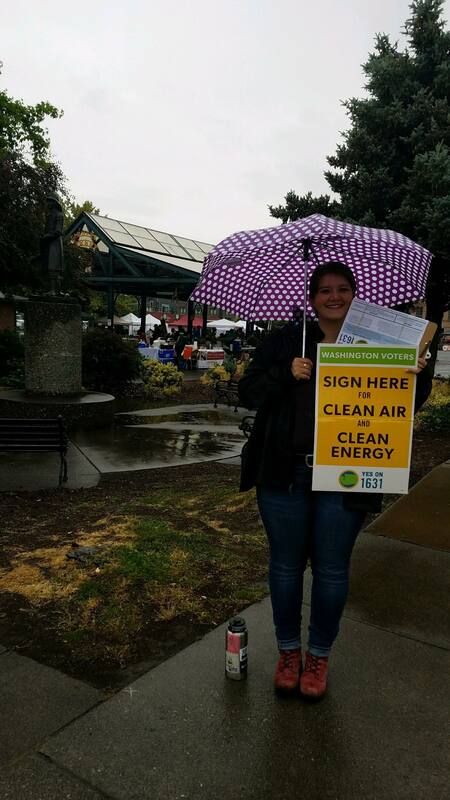 It’s surprising how many people are resistant to signing a petition for clean air and energy. Though people like him are discouraging, my morale is always lifted by the people who stop to talk—take an interest in the initiative and tell me that they support the work I am doing. This is just one facet of my summer internship with the organization Our Climate. Our Climate is a non-profit whose goals are to support and mobilize youth nation-wide in finding and implementing equitable solutions to climate change. As a Fellow, I work at the local, state, and national level to contribute to carbon initiatives and campaigns. Currently, my main focus is on Initiative 1631. This initiative was drafted and approved by over 100 organizations, including various tribes, health groups, and organizations of people of color. It proposes a fee on pollution for the largest corporate polluters in Washington state, and uses the revenue generated by that fee to invest in wind and solar energy, protection of Washington forests, and the communities most affected by climate change. One aspect that is often overlooked in discussions of climate change is how disproportionately affected communities of color are: tribes along the coast lose their land to rising sea levels, immigrant farm workers without documents are affected by the progressively hotter summers, impoverished people of color can’t afford to live sustainably like their rich, white counterparts. I-1631 is unique in that it takes this into account and provides alleviation for those communities. Currently, we’re in the signature gathering phase of the campaign–we need 260,000 signatures (over a quarter million!) to get the initiative on the ballot. I have been organizing events, meeting other Fellows within the organization and discussing strategies, recruiting volunteers, and attending videochat trainings with leaders around the country. Along with coordinating the events, I attend every one to guide and instruct volunteers and collect signatures myself. The last day to collect signatures is June 27th. After that deadline, my internship will include things such as writing letters to the editor, passing city council resolutions, and door to door canvassing for the campaign. Though the work isn’t always easy—I have spent many hours standing on my feet, getting “sign-holding” sunburns—it’s incredibly fulfilling. I leave every event feeling energized, having organized, lead, and participated in an event for a campaign I am passionate about. I am excited for these coming months of action on climate change and am even more excited for what the future holds beyond that: opportunities to continue making a difference, either through becoming involved in other non-profit organizations, heading one of my own, or being one of the state leaders that helps propel these movements forward.